MetaDefender Client needs to be configured using the "Sources" tab in the MetaDefender Management Console. This will permit the configurations of parameters of the client configuration. There will be other configurations that need to set manually in the config file later. 3. Use 7-Zip or similar service to extract the MetascanClient.exe and MetascanClientConf.ini files from the downloaded "MetascanClient.exe". 4. Copy the extracted files to any location on the system where you will be scanning. 5. Edit the ini files using the table below. Most of these parameters are meant for the GUI, and won't affect the command line scan. The maximum size of files to be scanned (in bytes). Any files with a size (in bytes) greater than this value will be skipped. The maximum number of files to be scanned per batch. Increasing this value increases the amount of system memory MetaDefender Client will use when scanning files. The maximum number of threads to be used in scanning. Increasing this value increases CPU usage by MetaDefender Client and the Metascan Server. The recommended value is at least 5 times the number of CPUs. The directory where MetaDefender Client will scan files. All of the files in this directory and in subdirectories will be scanned. If this value is blank, the entire system drive will be scanned. Default value is blank (entire system drive will be scanned). MetaDefender server URLs the MetaDefender Client should connect to. If multiple servers are specified, each URL should be delimited by “;” (semi-colon). Determines which scan options a user can choose from. Value is a comma-separated list of the scan types that are allowed. First value will be used as default scan level for each scan session. Note: If auto_start is enabled, it will use the first value as scanning. *Requires MetaDefender 3.8.1 or later. *Virtual image disk must contain a file system that is readable by Windows. A Linux specific file system such as Ext4 is not supported. Will only allow the user to choose Fast and Deep scans. Server response timeout in seconds. Max file size threshold for calculating hashes. If the file exceeds this value, it will be scanned without performing a hash look up. This command will conduct a full scan of the entire system, and will dump a log file in the same directory as the MetascanClient.exe. The important parameters to use are auto_start=1 and show_ui=0 . That will ensure that the scan will run automatically and is invisible to the user. 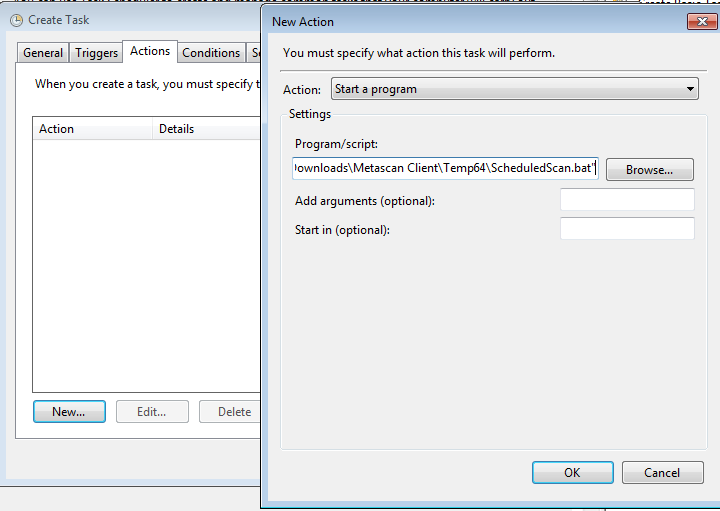 Determines whether the MetaDefender Client User Interface will be displayed. Determines whether the MetaDefender Client user interface will exit if all files scanned are clean. Determines whether the MetaDefender Client user interface will exit if there are dirty files found during a scan. 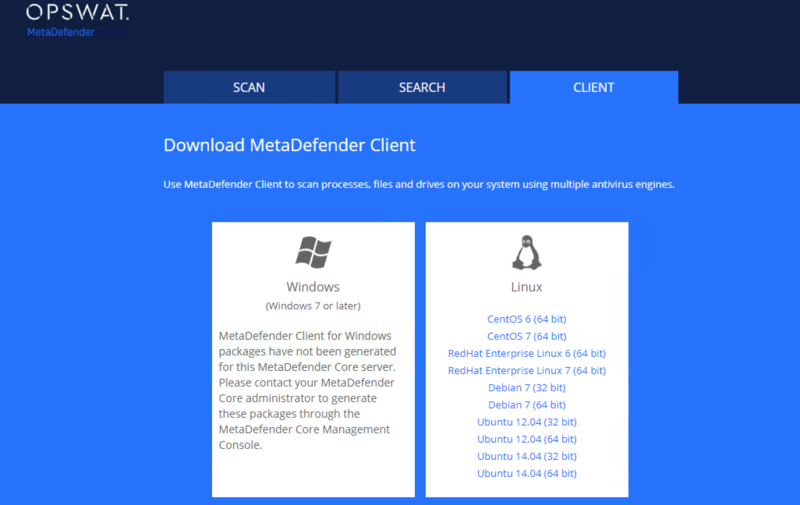 Determines if the MetaDefender clients will start scanning immediately once application launches. 1: MetaDefender Client will immediately start scanning. Note: show_ui=0 will be ignored if auto_start is not set to 1. Determines if the scan results should be saved automatically. 1: MetaDefender Client will automatically save scan results at the location where MetaDefender Client is located. API key given by OPSWAT when OPSWAT hosted server is used. 7. Now that the configuration and command line parameters are set. Create a *.bat file with the command that was just created. This article was last updated on 2018-03-28. How long is the support life cycle for a specific version/release of MetaDefender Client? 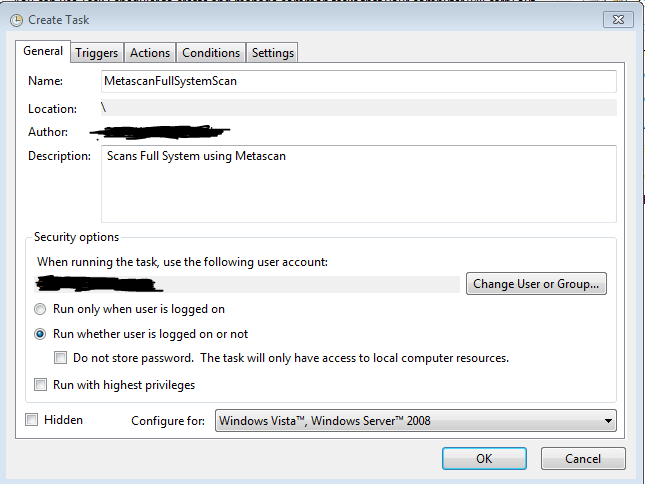 How to configure the automatic generation of MetaDefender Client scan reports?